The Apollo 11 Fiftieth Anniversary commemorative coins were issued by the United States Mint in 2019, commemorating the first landing on the Moon by Apollo 11 astronauts Neil Armstrong and Buzz Aldrin in 1969. Consisting of a gold half eagle ($5 coin), two different sizes of silver dollars, and a copper-nickel clad half dollar, each of the four was issued in proof condition, with all but the larger silver dollar also issued in uncirculated. The gold coins were struck at the West Point Mint, the silver at Philadelphia and the base metal half dollars at the Denver Mint and San Francisco Mint. All four coins have the same design. The obverse depicts a bootprint on the lunar surface, based on a photograph taken by Aldrin. That design is by Maine sculptor Gary Cooper, with engraving by Joseph Menna of the Mint. The reverse, as mandated by Congress, depicts the visor and surrounding helmet of Aldrin's space suit, with Armstrong, the U.S. flag and the Apollo Lunar Module Eagle in the reflection. This is based on a well-known photograph taken by Armstrong, and was created and engraved by Phebe Hemphill of the Mint. The depiction of Aldrin made him the seventh individual to appear on a U.S. coin who was alive at the time the coins were struck. The issued coins are curved, so that the obverse is concave (like the inside of a cup) and the reverse is convex (like its outside). Prior to the coins going on sale on January 24, 2019, there was anticipation that like the previous U.S. issue of curved coins, the 2014 National Baseball Hall of Fame issue, the coins might sell out. This did not prove to be the case, and none of the coins has yet met its sales limit. In 1961, U.S. President John F. Kennedy challenged his nation to land an astronaut on the Moon by the end of the decade, with a safe return to Earth. NASA worked towards this goal incrementally, sending astronauts into space during Project Mercury and Project Gemini, leading up to the Apollo program. NASA achieved its goal with Apollo 11, which landed on the Moon on July 20, 1969. Neil Armstrong and Buzz Aldrin walked on the lunar surface while Michael Collins orbited the Moon. The mission returned to Earth on July 24, 1969, fulfilling Kennedy's challenge. About an hour and a half after Armstrong first set foot on the lunar surface, Aldrin performed the Bootprint Penetration Experiment, an exercise in soil mechanics. Aldrin photographed an undisturbed area of the surface, then made two bootprints and photographed them. Those two bootprints were not disturbed by the astronauts' subsequent activity, and are visible in photographs taken from the lunar module Eagle prior to liftoff. About 13 minutes following the making of the bootprint photographs, after Armstrong had collected a bulk sample from the lunar surface, Aldrin was supposed to photograph the site the rocks had been taken from. Instead, he offered the camera to Armstrong, perhaps feeling that as Armstrong had taken the sample, he could make better use of the camera. 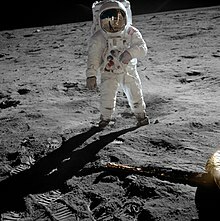 Armstrong took eight photographs before Aldrin resumed use of the camera; the eighth has been deemed "one of the most famous photos in history: a portrait of Aldrin, his gold-plated sun visor reflecting the photographer and the Lunar Module, the flag, and the moon’s horizon against an unimaginably black sky." The Apollo 11 coins were the brainchild of Mike Olson, a member of the Citizens Coinage Advisory Committee (CCAC) from Iowa, who thought of it in February 2014, several months before his term on the committee ended. He had seen the film Apollo 13 recently, having viewed it several times before, and felt there should be a coin issue in honor of the fiftieth anniversary of Apollo 11 landing on the Moon. The CCAC was preparing its annual report and he persuaded his colleagues to include a recommendation for Apollo 11 coinage. By the time the CCAC prepared its 2015 report, Olson had left the committee, but the chair, Gary Marks, took up the cause and got it included. In January 2015, Olson discussed his proposal with Iowa Representative Rod Blum, who referred the matter to Florida's Bill Posey, whose district included the Kennedy Space Center, and who as a young man had worked in the Apollo program. Posey obtained a bipartisan group of cosponsors and introduced legislation in June 2015. Legislation to mark the 25th anniversary of the Moon landing with coins had been introduced into Congress in 1993 but had failed, as had a bill in 2007 for the 50th anniversary of NASA. The 2015 bill was referred to the House Committee on Financial Services, where it sat; the website GovTrack.us gave it a 13 percent chance of enactment. Through 2016, advocates attempted to boost support for the bill, which by November had 298 cosponsors, enough to get a floor vote during the lame duck session of Congress. Olson continued his lobbying, as did the Astronauts Memorial Foundation and Astronaut Scholarship Foundation, each designated to receive some of the surcharges on the coins. Despite the support of Aldrin and Collins, the surviving Apollo 11 astronauts, the Senate version of the bill had only 11 cosponsors, far fewer than the 67 needed for a vote. There was danger that another commemorative coin bill might pass instead, and the bill would die with the expiration of the 114th Congress. On December 5, the last day of the House session, the bill was called up for debate by Congressman Posey, who then addressed the House in support of the bill, recounting the history of Apollo 11. Nydia M. Velázquez of New York and Frederica S. Wilson of Florida spoke of the hundreds of thousands of workers who had made Apollo possible, and applauded the inclusion of the Scholarship Foundation as a beneficiary, hoping the coins would have a legacy of young people entering the sciences. Posey spoke again briefly, and the bill passed without opposition. A final push by proponents resulted in 70 Senate cosponsors, three more than needed. Arkansas Senator John Boozman brought the bill to the Senate floor on December 9, and it passed without opposition. The bill became Public Law 114–282 with the signature of President Barack Obama on December 16, 2016, one of the final bills he signed as president. The act required that the coins be issued "in recognition of the 50th anniversary of the first manned landing on the Moon". They were required to have a curved shape similar to the 2014 National Baseball Hall of Fame commemoratives. These coins, with the concave design for the obverse resembling a baseball glove, had been enormously popular. There were to be up to 50,000 $5 gold pieces, or half eagles, 400,000 silver dollars, 750,000 clad half dollars, and 100,000 silver dollars containing five troy ounces of silver. All coins would have the same design, and would be available in uncirculated and in proof condition, except the five-ounce silver dollar, which would be in proof only. The design for the concave obverse could be selected through a design competition. A surcharge of $35 on the gold pieces, $50 on the five-ounce silver dollar, $10 on the smaller silver dollar and $5 on the half dollar would be collected. Once the Mint recouped its costs, the remainder would be distributed half to the Smithsonian Institution Air and Space Museum for its "Destination: Moon" exhibit, one quarter to the Astronauts Memorial Foundation and one quarter to the Astronaut Scholarship Foundation. The coins could only be issued during 2019. From May 1 to June 29, 2017, the Mint accepted submissions for the coins' obverse design. Those whose concepts made the first cut would be notified by July 31, with revised submissions to be made by September 8. The obverse was not to include the image of any living person, including an astronaut, and was to be "emblematic of the United States space program leading up to the first manned Moon landing". A total of 119 proposals were submitted, and a jury consisting of three members each of the Commission of Fine Arts (CFA) and the CCAC winnowed them down to 18 finalists. The Fine Arts Commission met on October 19, 2017; its members expressed some enthusiasm about the proposed designs. Some members of the CCAC when it met wanted to discard all the designs, predicting a sales disaster, but the chair, Mary N. Lannin said that one of them must be selected. The jury members met and viewed the designs on October 20. From the finalists, a design by Maine sculptor and medallist Gary Cooper was selected, depicting the footprint of an astronaut on the Moon. Cooper had a longtime interest in coinage, and had submitted an unsuccessful entry in the 1998 Sacajawea dollar design competition. During the second round of the Apollo 11 competition, Mint officials had him submit modified versions of his entry, altering the position of elements of the design. It was one of these alternatives that won the competition. For his efforts, Cooper was paid a total of $5,500, with $500 an award for participation in the second round and the remainder the prize for winning. Cooper's obverse design, together with the winning reverse design, was unveiled on October 11, 2018 at the National Air and Space Museum in Washington, DC in the presence of dignitaries such as Mint Director David J. Ryder and Apollo 7 astronaut Walt Cunningham. Cooper's concept was adapted for die production by Mint Sculptor-Engraver (now Chief Engraver) Joseph F. Menna. At the unveiling, Ryder stated the five-ounce silver dollars, once placed on sale, could sell out in ten minutes. The shared obverse for the coins, designed by Cooper, adapts the well-known photograph of an astronaut's bootprint, taken by Aldrin with a Hasselblad film camera, symbolizing the first step on the Moon. Cooper noted, "I recall seeing those first footprints, and it made so many people feel like that was their own footprint. I’ve never seen anything like that since." He noted that the original photograph had darkness in the recesses of the bootprint, forcing him to be creative. Along the rim are the words MERCURY, GEMINI and APOLLO, separated by phases of the Moon, becoming more full as the programs advance towards the Moon landing. LIBERTY is at the bottom, with above and to each side, the date 2019 (to left) and IN GOD WE TRUST to the right. The initials of Cooper and of Menna, and the mint mark of the facility where the coin was struck also appear on the obverse. Congress required that the image of Aldrin's helmet with Armstrong reflected in it form the basis for the reverse. Congress required that the reverse be a "close-up of the famous 'Buzz Aldrin on the Moon' photograph taken July 20, 1969, that shows just the visor and part of the helmet of astronaut Buzz Aldrin, in which the visor has a mirrored finish and reflects the image of the United States flag and the lunar lander and the remainder of the helmet has a frosted finish." Although it is not usual for a living person to appear on a U.S. coin, Congress mandated it be done in this case, making Aldrin the seventh person appearing on a U.S. coin to be alive at the time it was struck by the Mint—the sixth, Nancy Reagan in 2016, was still alive at the time her entry in the First Spouse gold coin series was minted, but died before the official release. Artists at the Mint produced three designs, and in June 2017, both CFA and CCAC agreed on one of them. That design was by U.S. Mint Sculptor-Engraver Phebe Hemphill, who also engraved her side of the coin. On the struck coins, the visor is framed by the words UNITED STATES OF AMERICA and E PLURIBUS UNUM; the denomination of the coin appears in the visor's upper left. Hemphill stated, "I over-emphasized the curvature [in the scene] to create the illusion of the curved visor." In the reflection on the visor may be seen the lunar module Eagle, the United States flag, and the photographer, Neil Armstrong. On December 13, 2018, ceremonial first strikes of both sizes of the silver dollar took place at the Philadelphia Mint. Offspring of the Apollo 11 astronauts: Mark Armstrong, Andy Aldrin and Ann Collins struck both size coins. The dignitaries who struck coins would be allowed to purchase them once sales opened to the public. Mint Director Ryder also struck a five-ounce piece and predicted the coinage program would sell out. Such a sellout would generate $14.5 million in surcharges for the beneficiary organizations. The Mint had difficulty in determining the proper angle for the curves so that the coins would strike fully, working out techniques on the five-ounce dollar and then adapting them for the smaller coins. Each die was created using cutting equipment, followed by hand finishing—no master die was used. Early attempts showed die cracks along the legs of the lunar lander, and problems with metal flow at Armstrong's hands. Adjustments, and a switch from .900 silver to .999, alleviated these problems. The two Apollo 11 silver dollars are the first U.S. commemoratives to be struck in .999 silver, with previous silver coins struck in .900 silver, and future silver commemoratives and other special pieces to be minted in .999. The three-inch silver dollar was struck on the Philadelphia Mint's only Graebener GMP 1000 press, obtained to strike the America the Beautiful three-inch quarters. Each die for the five-ounce silver dollar initially took 14 hours to make and would strike about 100 coins; this figure was later reduced to 11.5 hours. In advance of the opening of sales on January 24, 2019, it was anticipated that some or all of the different varieties of the new coins might quickly sell out, marking the first time that had occurred since the Hall of Fame issue in 2014. This issue, with the coins curved like the Apollo pieces, had seen the 50,000 gold coins sell out in a matter of minutes, with the 400,000 silver dollars gone in less than two weeks. The clad half dollars had not sold out, but over 400,000 had been sold, leading to surcharges totaling nearly $8 million for the designated beneficiary, the Baseball Hall of Fame. On January 18, introductory prices for the non-gold coins were announced, with prices for the gold to be determined based on the price of gold closer to the opening of sales. The five-ounce silver dollar, from the Philadelphia Mint, would cost $224.95, with an initial household order limit of one. 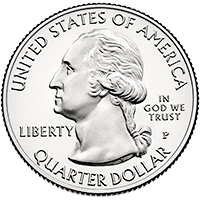 The smaller silver dollar would cost $54.95 for the proof coin and $51.95 in uncirculated, with a household order limit of 100. The half dollar in uncirculated condition, struck at the Denver Mint was $25.95 each, and the proof coin (struck at the San Francisco Mint) was $27.95, with no order limit. A set containing both the proof Apollo 11 half dollar and a 2019–S Kennedy half dollar in enhanced reverse proof condition, restricted to 100,000 sets and with an order limit of five, cost $53.95. Prices for the gold pieces, struck at the West Point Mint, were set at $418.50 in proof and $408.50 in uncirculated, with an initial limit of one gold coin per household, regardless of condition. A ceremony was held at the Kennedy Space Center Visitor Complex on January 24, 2019, marking the release of the Apollo 11 coins. The CAPCOM during Eagle's landing, Apollo 16 Lunar Module Pilot Charles Duke, spoke at the ceremony, stating the new issue would bring back memories of the day Apollo 11 landed on the Moon. Duke applauded that the issue would raise money for worthy causes and stated he planned to buy some of the gold coins. Ryder had been scheduled to speak at the Florida event, but due to the partial government shutdown, he could not attend. The Apollo 11 coins went on sale to the public on January 24, 2019 at 12 noon EST through the Mint's website and via telephone, as well as being available at the sales center at Mint headquarters in Washington, at the mints in Philadelphia and Denver and at the ceremony site at Kennedy Space Center. Collectors reported minimal difficulties in placing their orders online, and although the three-inch dollar went into backorder status within an hour, figures released by the Mint showed that none of the coins had come near sellout on the first day of sales. The fact that none of the coins sold out on the day of issue brought varied reactions. Dave Harper, editor of Numismatic News, suggested the program might be a failure, and that the sales figures "do show a lack of early enthusiasm already." Olson expressed pleasure with the first day's sales, predicted all would sell out by the end of the year, and noted that no collector had been shut out from getting coins. Coin forum bloggers deemed the sales to be dismal, and that they foretold a poor future for numismatics in the United States. A total of 296,311 Apollo 11 coins were sold in the first 24 hours, with the five-ounce silver dollar the leader both in number sold (51,271) and percentage of the mintage authorization sold (51.3 percent). At noon EST on January 25, the limit on the number of coins that could be sold to a single household was waived. On January 29, the Mint announced that the packaging for the 70,000 half dollar sets that had been shipped, containing a 2019–S Apollo 11 half dollar in proof condition and a 2019–S Kennedy half dollar in enhanced reverse proof finish, contained a factual error. The packaging credited former chief engraver Gilroy Roberts with the design of both sides of the Kennedy half dollar when in fact he had designed only the obverse, with Frank Gasparro responsible for the reverse. The Mint halted shipments and made plans to print corrected packaging, which as well as being sold on the remaining pieces, would be made available to those who had already purchased the set. The set was limited to 100,000 as that was the mintage limit of the special Kennedy half. Sales of this set reached 94,119 by February 10 and it showed as unavailable on the Mint's website. However, this was not a sellout of the Apollo 11 half dollar, but only of the Kennedy piece—only 163,434 of the Apollo 11 half dollars had been sold as of that date, just over a fifth of the authorized mintage. By February 21, the proof half dollar set had sold out entirely. On February 25 at 3 pm EST, introductory pricing ended, and prices increased by $5. Ryder had pledged at the December 2018 first strike ceremony to have some of the coins sent into space, and this came to pass with the March 14, 2019 launch of the Soyuz MS-12 mission from Kazakhstan, as the payload included two 2019-S proof clad half dollars. Upon their return to Earth, one is to be exhibited at Mint headquarters and the other at the Air and Space Museum. ^ a b "Apollo 11 Mission Overview". NASA. December 21, 2017. Retrieved February 14, 2019. ^ "Mercury and Gemini". The Space Race. National Air and Space Museum. Retrieved February 11, 2019. ^ a b c Shiner, Linda (February 2019). "Commemorative Coin Throws a Curve at Apollo History". Air & Space/Smithsonian. Retrieved February 10, 2019. ^ Jones, Eric M., ed. (1996). "Mobility and Photography". Apollo 11 Lunar Surface Journal. NASA. Retrieved February 10, 2019. ^ a b c Gilkes, Paul (January 1, 2019). "Efforts to push forward the Apollo 11 coins bill nearly failed in 2016". Coin World. Retrieved February 9, 2019. ^ a b c d e f Roach, Steve (June 26, 2015). "Legislation seeks coins celebrating 50th anniversary of Apollo 11". Coin World. Retrieved February 10, 2019. ^ Gollino, Louis (November 4, 2016). "Final push coming for Apollo 11 commemoratives". Coin World. Retrieved February 9, 2019. ^ a b c d e Unser, Darrin Lee (January 24, 2019). "2019 Apollo 11 50th Anniversary commemorative coins launch". CoinNews.net. Retrieved February 9, 2019. ^ Unser, Mike (October 11, 2018). "2019 Apollo 11 50th Anniversary Commemorative Coin Designs Revealed". CoinNews.net. Retrieved February 10, 2019. ^ Gibbs, William T. (April 21, 2017). "To the moon and back: Apollo 11 coins design competition to start by U.S. Mint". Coin World. Retrieved February 8, 2019. ^ a b c d e f Gilkes, Paul (October 12, 2018). "Perseverance pays off for Apollo 11 coin design contest winner". Coin World. Retrieved February 8, 2019. ^ McAllister, Bill (October 20, 2017). "U.S. Mint launches design review for the 2019 Apollo 11 50th Anniversary coins". Coin World. Retrieved February 8, 2019. ^ Gilkes, Paul (October 11, 2018). "U.S. Mint unveils designs for 2019 Apollo 11 50th Anniversary commemoratives". Coin World. Retrieved February 8, 2019. ^ a b c d e Gollino, Louis (January 30, 2019). "Apollo 11 50th Anniversary Coin Program launched on January 24". Coin Update. Retrieved February 11, 2019. ^ "Making his mark: A Belfast artist designs the U.S. Mint's commemorative moon-landing coin". Down East. February 2019. Retrieved February 11, 2019. ^ Headley (October 31, 2016). "Why are only dead presidents featured on U.S. coins?". The Spruce Crafts. Retrieved February 12, 2019. ^ Unser, Mike (June 22, 2017). "Reverse 2019 Apollo 11 commemorative coin designs reviewed". CoinNews.net. Retrieved February 8, 2019. ^ Gilkes, Paul (December 14, 2018). "Apollo 11 commemorative coins launched in first-strike ceremony". Coin World. Retrieved February 8, 2019. ^ a b Gilkes, Paul (December 21, 2018). "Apollo 11 3-inch silver dollar provides challenge in production". Coin World. Retrieved February 8, 2019. ^ Gilkes, Paul (February 22, 2019). "U.S. Mint replaces 90 percent silver alloy with .999 fine silver". Coin World. Retrieved February 23, 2019. ^ Gilkes, Paul (January 4, 2019). "Could the Apollo 11 coin program break a five-year trend?". Coin World. Retrieved February 9, 2019. ^ Gilkes, Paul (January 18, 2019). "Proof 5-ounce silver dollar to cost $224.95 when it goes on sale starting Jan. 24". Coin World. Retrieved February 10, 2019. ^ Jaramillo, Antonia (January 24, 2019). "Now on sale: US Mint's official Apollo 11 commemorative coins". Florida Today. Retrieved February 8, 2019. ^ a b Gilkes, Paul (January 25, 2019). "U.S. Mint launches sales Jan. 24 for Apollo 11 50th Anniversary commemorative products". Coin World. Retrieved February 9, 2019. ^ Harper, Dave (January 25, 2019). "Could Apollo program be failure already?". Numismatic News. Retrieved February 9, 2019. ^ Unser, Mike (January 25, 2019). "Apollo 11 commemorative coin sales reach 296,311 in first day; limits lifted". CoinNews.net. Retrieved February 9, 2019. ^ Gilkes, Paul (January 29, 2019). "Apollo 11 half dollar set packaging contains factual error". Coin World. Retrieved February 9, 2019. ^ Unser, Mike (February 12, 2019). "US Mint sales: Lowell quarters and 5 oz. coin debut". CoinNews.net. Retrieved February 12, 2019. ^ Unser, Mike (February 21, 2019). "US Mint sales: 2019 Native American dollar debuts". CoinNews.net. Retrieved February 26, 2019. ^ "Apollo 11 coin introductory pricing ends Feb. 25 at 3:00 P.M. ET". CoinNews.net. February 25, 2019. Retrieved February 26, 2019. ^ Gilkes, Paul (March 15, 2019). "NASA sends two proof 2019-S Apollo 11 50th Anniversary half dollars into space". Coin World. Retrieved March 16, 2019. The Half-Union was a United States coin minted as a pattern, or a coin not approved for release, with a face value of fifty U.S. Dollars. It is often thought of as one of the most significant and well-known patterns in the history of the U.S. Mint. The basic design, featuring Liberty on the obverse, was slightly modified from the similar $20 "Liberty Head" Double Eagle, which was designed by James B. Longacre and minted from 1849 to 1907. The Norway lunar sample displays are two commemorative plaques consisting of small fragments of Moon specimen brought back with the Apollo 11 and Apollo 17 lunar missions and given in the 1970s to the people of the Kingdom of Norway by United States President Richard Nixon as goodwill gifts. NASA space-flown Gemini and Apollo medallions were mission-specific commemorative medallions—often astronaut-designed—which were approved by NASA and carried aboard the mission spacecraft into orbit. Beginning with the first manned Gemini mission in 1965, commemorative medallions were prepared for the astronauts at their request. These were produced by a company only known as Fliteline and were struck either in a pewter-colored base metal, sometimes painted a gold color, or sterling silver, and were flown on all 10 manned Gemini missions. A Fliteline medallion was designed and produced for Apollo 1, but was never officially flown after a disastrous cabin fire during a launch rehearsal killed the flight crew.